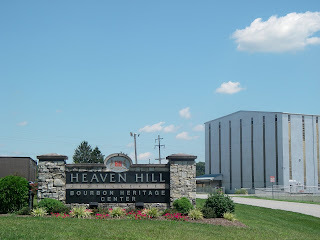 We had a great day that started with a tour at the Bourbon Heritage Center. We knew something about Bourbon but it was neat to learn more of the details of Bourbon production. The large warehouse (7 stories) in the background stores 20,000 barrels of Bourbon that are aged at the ambient environmental temperatures. The barrels expand and shrink every year with the natural temperature fluctuations and the Bourbon absorbs the flavors from the barrel during the aging. Different parts of the warehouse create different conditions and different qualities of Bourbon. After a Bourbon tasting, we headed back into town to visit "My Old Kentucky Home." 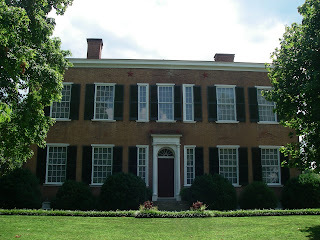 This home was the inspiration for the Stephen Foster song, My Old Kentucky Home. It is furnished with almost all the original furnishings from the Rowan family and has recently been renovated to restore the original paint colors and wallpaper patterns. It is a beautiful home and a great example of classic Georgian architecture combined with Federal. At the end of the day we headed downtown to see the historic buildings. 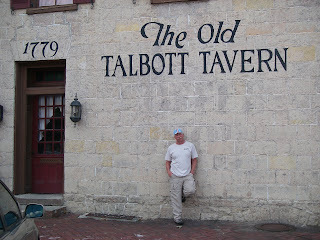 This tavern was the original stage stop and is currently a tavern, restaurant, and bed and breakfast. We also visited the Museum of Whiskey History and learned more about all the local families and distilleries. Seems like a VERY good place to stop and taste the local sites. Yes Michael, especially if your taste runs to fine Kentucky Bourbon, the very best is here. Salud! Steve is green with envy! He suggested some things you might be interested in if you're heading to Lexington. He has connections with local farmers (organic and conventional), the University of Kentucky research center, farmer's markets, horse farms, etc. and could hook you up with tours/visits if you want. His only request is that you sample and rank all the bourbons you taste! He's mighty fond of Kentucky bourbon. Wow, what a fantastic week! First it was history, then it was bourbon, and now it's the History of Bourbon. What a perfect combination. Cheers, mas. Hey Diana, well thanks for the offer but we won't be going to Lexington, however.. we thought that Elijah Craig 18 year old was awesome, but for our money, Evan Williams Single Barrel tasted better. Four Roses 12 year old was very distinctive and worth a try.